Do you know what the occasion was? A group of happy young children in uniform are pictured here in what must be the Methodist Church Hall. 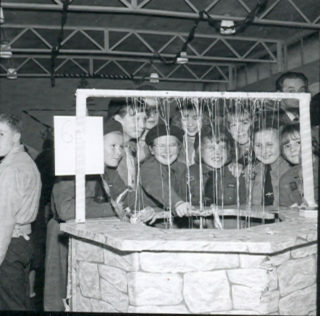 Strings hang down from a thin wooden frame over the well. If you know which group this is, or have any interesting memories or comments to help us shed light on this obviously fun event, let us know below. The photograph dates from 27th November 1965. This page was added on 12/03/2010. Could the uniforms be Brownies or Guides both associated with the Methodist Church, or Girls Life Brigade associated with the Baptist Church, or the other way around. I was in both clubs in the 50’s.